A CELEBRATION of 40 years of the InterCity 125 high-speed train was marked with an open day at St Philips Marsh depot, Bristol, on May 2. 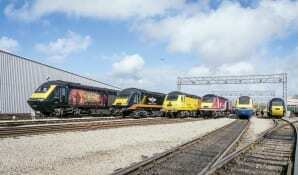 The event, which attracted more than 5,000 visitors, was organised by GWR and its depot staff. Part of the depot was used, with the other half remaining operational, although the exhibits did have to be moved before the servicing and preparation of train sets for the following day’s service could begin.